"Resident Evil 1" redirects here. For the first live-action "Resident Evil" film, see Resident Evil (film). "Biohazard 1" redirects here. For biological hazards, see Biohazard level 1. 4.2 Director's Cut Dual Shock Ver. The live action full motion video sequences were filmed in Japan with a cast of American actors. All Japanese releases contain English voice acting with Japanese captions and text. However, Japanese voice performances were also recorded but were left unused, as Mikami found the quality of the performances inadequate. However, lead programmer Yasuhiro Anpo later said that, due to all of the development staff being Japanese, they were unaware of the "poor localization" that apparently "hindered the realism and immersion of the title" for the international release, which was one of the reasons for the re-dub in the 2002 remake. The original Japanese PlayStation version also features a vocal ending theme, "Yume de Owarasenai..." (夢で終わらせない..., "I Won't Let This End as a Dream..."), performed by Jpop band Fumitaka Fuchigami, that is not in any other versions of the game. A Nintendo DS port, Resident Evil: Deadly Silence, was released in Japan as Biohazard: Deadly Silence (バイオハザード デッドリーサイレンス, Baiohazādo Deddorī Sairensu), and was made to commemorate the tenth anniversary of the series. Deadly Silence includes a "Classic Mode", the original game with minimal enhancements and touch-screen support, and a "Rebirth Mode", containing a greater number of enemies and a series of new puzzles that make use of the platform's specifications. ^ Known in Japan as Bio Hazard, stylized as BIO HAZARD (Japanese: バイオハザード, Hepburn: Baio Hazādo). 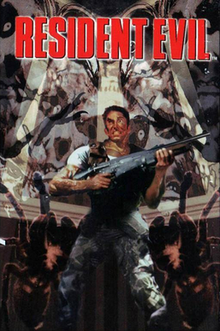 The original game spelled the title as two words, instead of the one-word convention used from Biohazard 2 and onward. ^ "We also recorded Japanese voices (for the game), not just English ones. They were discarded because they were really lame." (英語だけでなくじつは日本語のボイズ収録も行なった。　カッコ悪かったのでボツに。, Eigo dake de naku jitsu wa nihongo no boisu shūroku mo okonatta. Kakkowarukatta node botsu ni. ), The True Story Behind BIO HAZARD, page 157. This page was last edited on 12 April 2019, at 00:27 (UTC).